NMM 8884. Marine Band bell harmonica by M. Hohner, Trossingen, after 1897. 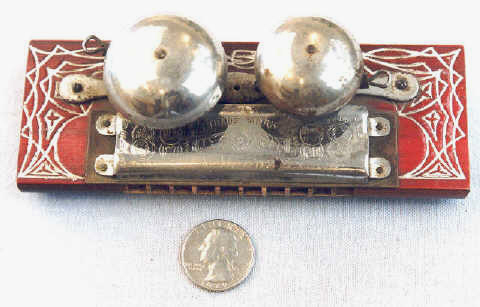 Most bell harmonicas have two bells mounted on top, like this Hohner model. The bells were played more for rhythm than for musical effect. 10 holes, 20 reeds. Alan G. Bates Collection, 2000.